Share the title and author, too, so that other TT participants can add the book to their TBR Lists if they like your teasers! "Your friends left you?" Now his expression changed. He was surprised. 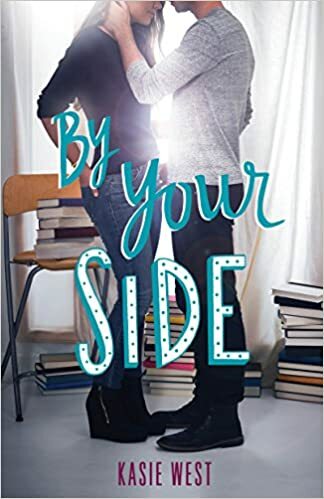 An irresistible story from Kasie West that explores the timeless question What do you do when you fall for the person you least expect? When Autumn Collins finds herself accidentally locked in the library for an entire weekend, she doesn’t think things could get any worse. But that’s before she realizes that Dax Miller is locked in with her. Autumn doesn’t know much about Dax except that he’s trouble. Between the rumors about the fight he was in (and that brief stint in juvie that followed it) and his reputation as a loner, he’s not exactly the ideal person to be stuck with. Still, she just keeps reminding herself that it is only a matter of time before Jeff, her almost-boyfriend, realizes he left her in the library and comes to rescue her. Only he doesn’t come. No one does. I love getting comments. Let me know what you think. This blog is now officially declared an Award Free zone! I do appreciate your kindness in thinking of me and I am humbled by your generosity. Your comments are award enough for me. Comment away! I was a school library/media specialist for a small school district in Southeast Minnesota. I retired after 41 years in media centers in June 2017. I love reading! My favorite genres are adult, YA and Middle Grade paranormals, science fiction/fantasy, and mysteries. I am also a fan of adult romances and romantic suspense. I maintain two book blogs. Ms. Martin Teaches Media is used to blather about the YA books I read. Inside of a Dog is my home for the adult books I read. Beginning January 1, 2012, I will no longer be accepting self-published books for review. If I accept your book, I will agree to read, review, and post the review prior to the book's publication date only if I receive the book a minimum of 21 days before the book is published. Books arriving later than that will be reviewed as they fit into my review schedule. I prefer books in these genres: paranormal romance, urban fantasy, mystery, science fiction, fantasy and romance. I will be limiting myself to three adult books and three young adult books per month for review. I will accept either print books or ebooks formatted for my Kindle. Please contact me with any questions. I am not able to respond to every request but will respond if I am interested in reading the book. Kathy has read 80 books toward her goal of 250 books.